Just arrived for the summer - the whole range of Yamaha Seascooters will add some extra fun in the pool. These water scooters are super exciting. 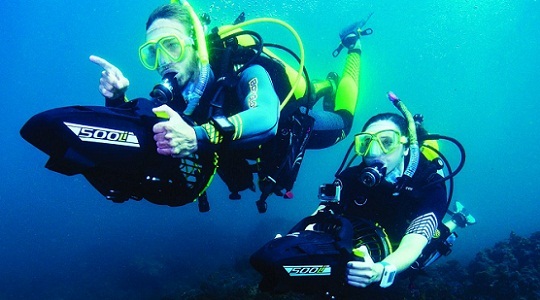 Whether you are diving or snorkeling, these aqua scooters have amazing propulsion system which will speed up your underwater ride. This premium pool or lake propulsion vehicle will take your adventures to the next level. Built for safety, with floating chassis, auto shutoff functions and protective grills this amazing sea scooter can ride with speeds up to 2 miles per hours. It works on maximum depth rating of 15.5 feet and gives 1.5 hours of run time with normal use. Suitable for children or adults ages 8 and up, sea scooter will add super fun to your water games.